Author Jackie Haugh – Past, Present, or Future? Cuddling him close, I gave Lovey back, but just as I did, he dropped it to the floor again and wrapped his little arms around my neck, putting his tear-stained cheek next to mine. Holding him close, I was reminded of all the sweet times I had done this with my children but rarely had I stopped to treasure the moment. Life was busy with four kids, and I was on overload. I’ve heard people live in three locations: the past, present, or future. My dear friend and life coach, Libby Ackley, once asked me, “Where do you live?” Looking into her chocolate-colored, Bambi-like eyes, I stopped to think. Where did I live? I’d love to say I’m a present kind of gal, because isn’t that where we’re supposed to be? We hear it all the time—“Be mindful of the moment,” “The future is not here, and the past is gone,” etc. But being present is not an easy thing to do with our busy lives. Many live in the future, fearing what will come next: bills, retirement, are the kids on track for a brighter future, and how to get life’s minutia done. Others might long to live in the past, wishing they were still there because their current world is difficult. When I travel backward, I try to remember its joy as well as learn from the pain. Unfortunately, being in the past usually sends my mind into overdrive over all the whys: why this or that didn’t work out, why I acted like such a fool, and how could I find ways not do it again. Living with how I could have done things differently to change my current circumstance gets exhausting, but I think I’ve found the secret to truly be in the moment. Unlike when my children were little, today when I spend time with Bo, the world around me stops. I don’t care about the laundry list of household chores or the mountain of bills sitting on my desk. And analyzing what has been just has to wait because I’m glued to the wonderment in his precious face as he explores his world, the giggle in his belly over my horrible singing, and the peacefulness in his breathing when I rock him to sleep. 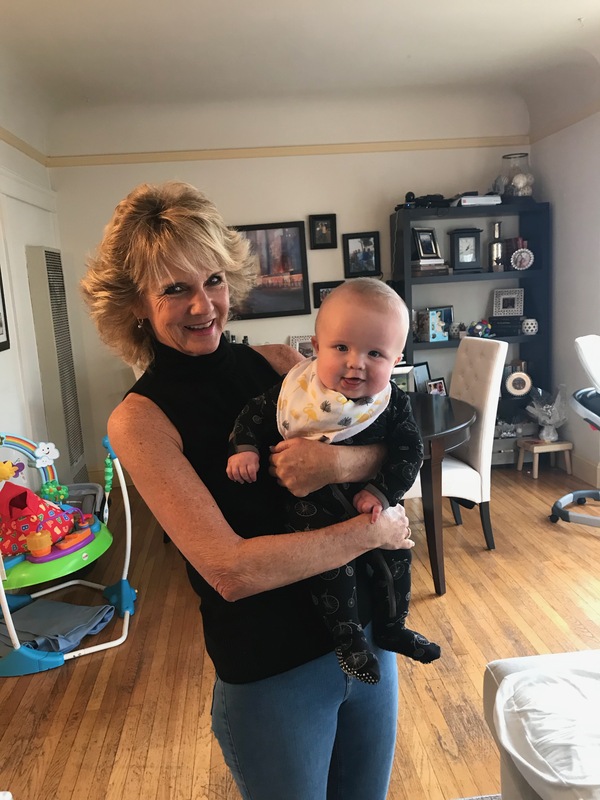 As a grandparent, I’m allowed to fully be in the moment because all I have to do is love him. The day flies by as we become tethered to each other’s heart. So, if you’re like me and find it hard to stay in the moment, I suggest you beg, borrow, or maybe even steal a baby (with the parent’s permission, of course) and just take time to sit. Soak in the miracle of this new life, connect your breath with theirs, and believe in the magic of their true becoming. To be present takes practice, and practice makes perfect, and an excellent way to practice is with a child. Not only will you find pleasure and a peaceful surrendering, but with enough of it, you may find the ability to be in the here transfers to your everyday life too. Go to the home page subscribe to my website for the latest musings!